Historic lighthouse built in 1875 and home of a maritime museum. Climb the old spiral stairs to the light for a view of Lake Michigan and White Lake. Built in 1875 by Captain William Robinson, the White River Light Station now serves as a physical reminder of the rich nautical history of Michigan. The light house is now a museum and open to the public. Plan a visit to the museum and climb the spiral staircase to the top of the light house tower, browse the many 19th and early 20th century photographs and examine our collection nautical artifacts, look out across Lake Michigan as the light house Keeper did a century ago. Photographs, paintings, artifacts and stories can instill a renewed sense of our Maritime History, which is rich in folklore. The bustling enterprises of the age; shipping, logging, the Lighthouse Service, the fishing industry and the resort center activities are depicted in numerous exhibits. They chronicle local activities, while placing them in the larger perspective of regional Great Lakes Maritime history. The collection of artifacts entice one to discover and learn firsthand about the nautical and navigational devices including: a binnacle, compasses, bilge pump, chronograph, sextant and a ships helm among many items. 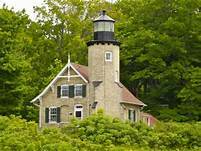 Listen to a fog horn, see the original Fresnel lens which reflected the source in the tower, and climb the spiral stairs for a glimpse of Lake Michigan´s unique sand dunes that stretch along the coastline to azure waters.